Most people are familiar with the popular social media sites: Facebook and Twitter. As a professional actor, I use these as my main marketing tools. They are important pages, but finding the time to manage them can seem daunting. And then, every day, someone is telling me about another social media platform that I must join – the newest, latest or greatest. Often when I feel overwhelmed by something, I stay away. So I’ve decided to take you on this journey with me to take a look at some social media sites that I would like to better understand. and how these essentially free social networking sites can help. Vine (https://vine.co) I mentioned Vine a couple of times in my social media moment. Most recently, on EP78 (http://natalieandwayne.com/2015/03/18/ep78-erick-chavarria) when talking about a panel with casting directors at SXSW (http://www.theguardian.com/film/2015/mar/14/sxsw-film-casting-directors-say-acting-talent-counts-for-7-in-their-decisions) who said they are finding new talent on Vine. Basically, Vine is a place to share six-second videos. When you get the app, you can film an all-in-one take or separate shorter moments and Vine will put them together as a six-second video. Then the video plays on a loop. Why it’s good for actors — As actors, we want to be on camera and we want people to see our talents. What better way than on Vine? Whether you want to just show your acting chops or just your personality, I think Vine should definitely be an option to consider. We are being told to make videos shorter and you can’t get much shorter than six seconds! “A picture is worth a thousand words.” I enjoy sharing pictures on social media, but for the longest time, did not feel it was necessary to be on Instagram. After countless people telling me to join, I decided to check it out. Instagram is an app that can be downloaded on most smart phones that allows you to share pictures and videos, instantly. Before posting, you have the option to change up the tone of the picture or video by adding a filter. Instagram also gives you the opportunity to share to Twitter, Facebook and other social media platforms. Why it’s good for actors - Instagram gives you a place to tell your story through photos and videos and share it with others. In this business, we are constantly running around and may not catch up with friends and family as much as we would like. This is a quick and easy way to stay in touch, until you can make that next phone call or trip back home. You can keep your loved ones up to date with what is going on in your world and they can do the same. Also, Instagram allows videos up to fifteen seconds. That’s nine more seconds than Vine. Just think of what story you can tell with the additional time! Actors are creating short web series and uploading them to Instagram. A perfect example of this are Hollywood Close-Up’s past guests, Heather Lee Moss and Anna Borchert (http://natalieandwayne.com/2014/10/01/ep57-heather-lee-moss-and-anna-borchert), who are the creators and stars of the faux Instagram reality show, Daughters of POP (https://instagram.com/therealdaughtersofpop). My best girlfriend from college talked me into joining Pinterst and since I was the one who talked her into getting on Facebook, I knew that I had to build a profile. But that’s all I did. Sorry, BFF, the truth comes out! Of course, she knows I’ve done nothing on there because she can see my profile. Well the good news is, once I logged in and went to my profile, a little box popped up on the bottom right saying “learn about your profile and how to use it.” Sweet! So, what is Pinterest? A pin is a visual bookmark. 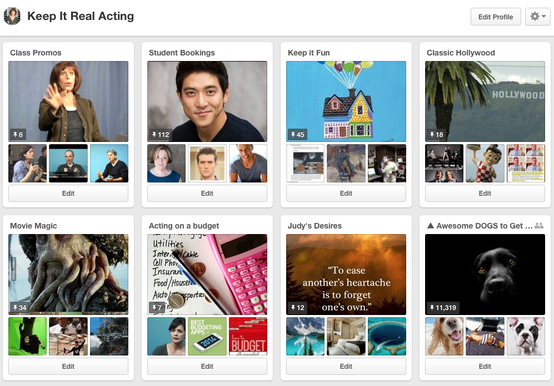 You create online bulletin boards, name them and then pin your interests to them. It’s completely visual. It says goodbye to the days of bookmarking on your computer and definitely to printing things out and thumb-tacking them to a corkboard. Why it’s good for actors — This all sounds simple enough and fun, but how might this help me with my social media marketing for my acting career? We are constantly being told to have a life outside of acting and I think this is a pretty quick and easy way to share that part of your life with others. It’s another way to connect and share your interests and be a resource for others. Seems to be an exclusive online club for people with a google account. Google+ works with circles. I like this because it seems like a clear way to manage your friends list. You can add people to your circles or follow them as you would on Twitter and now on Facebook. The main draw for me in this one is Google hangouts. These video chats can be private or public and you can chat via text or by video with up to ten people. Why it’s good for actors — Imagine what you can do with these hangouts when you are trying to do a crowd-funding project! I can see how Google+ can work for larger businesses, but would be great for actor groups who work together that cannot get together that often in person. Late night discussions about the biz on Google+ can help with accountability. Also, I noticed that if you post a video to your YouTube account, it goes onto your Google+ profile. Just another way for industry professionals and friends to easily see your work. As an actor, what social media sites do you find most helpful? Natalie Lipka (“Criminal Minds,” “Kroll Show”) is an actor, writer, and producer. She currently hosts Hollywood Close-Up with Wayne Frazier (“Transparent,” “Kroll Show”), an audio podcast that focuses on creating your own career in the entertainment industry. On the show, Natalie and Wayne discuss the latest in the entertainment world and trending topics in social media, and provide insight to those pursuing a career in “the biz.” Each episode includes a close-up interview with one of Hollywood’s finest working actors, directors, producers, writers and other industry professionals. There are a tremendous amount of resources available for actors today. We are all aware of Facebook, Twitter, Instagram, etc…and we know how to use them in our personal lives. However, it’s important to realize that these mere social media outlets are brilliant, golden tools for promoting your career as an actor for exposure. The word to emphasize here is: exposure. Whether you are Tom Hanks or John Doe, every performer can be a “celebrity” in their own capacity. No matter how big or small the project you are doing, it is of utmost importance that you share it online. If you show the world you are constantly working, then the world will be excited for you and support you. While there are a number of ways to build a fan base & promote yourself online, today I’ll focus on one: the Facebook Fan Page . -Invite all of the friends from your Personal Page to “Like” your Actor Page. Some people may not at first, which is fine, try inviting them again later on. You’re not annoying them, just being persistent. Stop at nothing. -Post everything you are doing as an actor. New headshots, set photos, clips, reels, YouTube videos, selfies in your costume, set photos, behind the scenes pictures…there are endless possibilities! You can also tag your projects by using “@” in front of the title to help the project itself get exposure, if they have a page as well. They will appreciate it! -Display your actor links (IMDB, Website, etc.) in the “About” section! This is a useful section to promote your online presence as an actor. You can put two links in total, and when you do they will be displayed under your profile picture at the top of your Actor Page. To do this, click “About”, then click the “Page Info” tab, and put your links in the “Short Description” box. This may take some trial and error because sometimes links don’t always fit and have to be shortened. Once everything is up and running, your page will look professional For links to display, I would suggest your Actor Website and IMDB page but you can also put your casting profiles (Actors Access, Lacasting, Nowcasting, Casting Frontier). -Sponsor your Actor Page to get more Likes and/or promote your posts. This is what Facebook calls Sponsorship. It does cost money, which isn’t for everyone, but you can choose the amount you want to spend from $2 upwards. I’ve found it to be totally worth it. If you are getting people who don’t know you, but like your work, that is a good sign for the lack of bias. If you want a maximum amount of Likes and exposure, you will probably need to promote your posts. The reason is: people have TONS of posts popping up on their Facebook newsfeed. So, by promoting you are simply making your posts more visible to them among the other thousands they see. -Be careful when sponsoring your Facebook. You may get messages/posts from people you don’t know. If this occurs, it is up to you whether or not you want to allow strangers to have contact with you. If not, you can change the settings of your page by going to “Edit Page”, and then “Edit Settings”. Overall, the Facebook Actor/Performer Page will give you your OWN audience. As you book bigger projects, your initial fans will take pride in discovering you first…and people love that. Go for it! Justin Sorvillo moved to Los Angeles to study at the two-year conservatory, The American Academy of Dramatic Arts. Following his graduation, he became involved in several regional theater productions on stages including South Coast Repertory and The Geffen. He has performed in many independent films, web series and other ambitious projects. His latest credits include a supporting role in the sci-fi feature film, Space Command: Redemption featuring Mira Furlan & Bill Mumy.